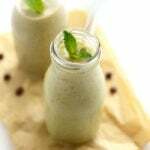 Let me introduce you to the creamiest and most delicious banana smoothie. 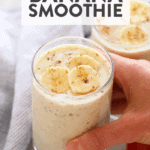 This healthy banana smoothie is simple and packed with protein, fiber, and potassium! 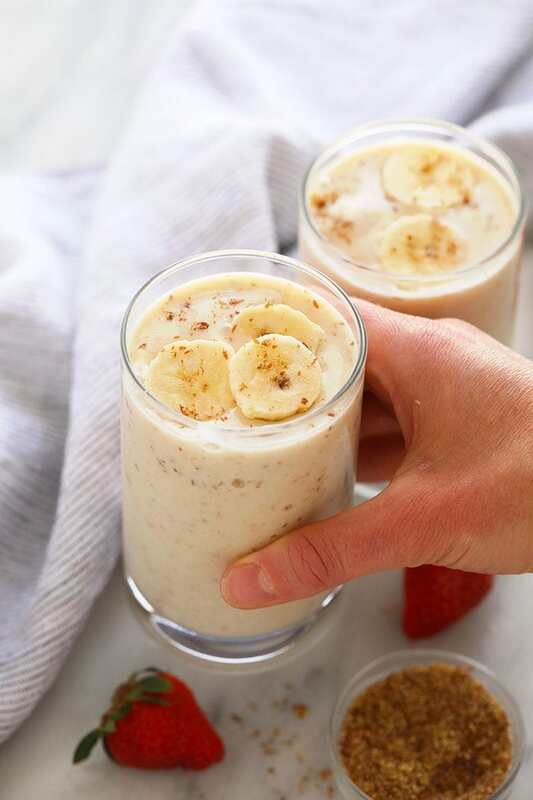 Blend it up this week for a healthy banana smoothie breakfast! 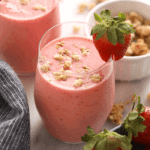 Smoothies are a one-stop shop for something tasty that is also packed with nutrition! Healthy smoothies have been getting more and more complex as we try to pack them full of as many fruits and veggies as possible. Have you guys tried Daily Harvest Smoothies? 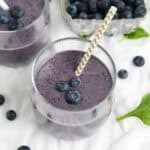 They do an amazing job at packing insane servings of vegetables and fruits into their smoothies AND they are naturally sweetened. When we don’t have time to mix up a homemade smoothie, we throw a daily harvest in the blender and BOOM. 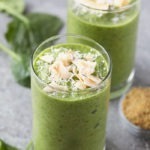 We have started to create more complex smoothies on FFF, too! 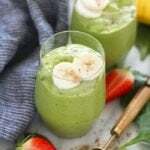 Our classic green smoothie recipe has spinach, avocado, cauliflower, bananas, and dates. It’s just delish. 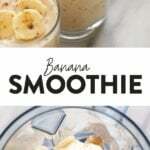 Today we are taking a break from fancy smoothies and keeping it simple with a banana smoothie! The key to a perfect banana smoothie is the frozen bananas! 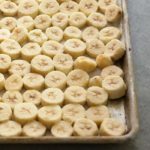 Forget the ice and slice up a bundle of bananas, freeze them, and use those frozen bananas as the base for your smoothie. We do a step by step tutorial on how to freeze and store bananas in this How to Freeze Bananas Post. I highly recommend prepping a bunch of bananas for smoothie prep throughout the week. Is a banana smoothie good for you? 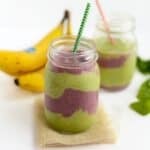 What smoothie you prepare for yourself depends completely on what your body needs! 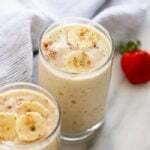 This banana smoothie is a great healthy breakfast or snack throughout the week. 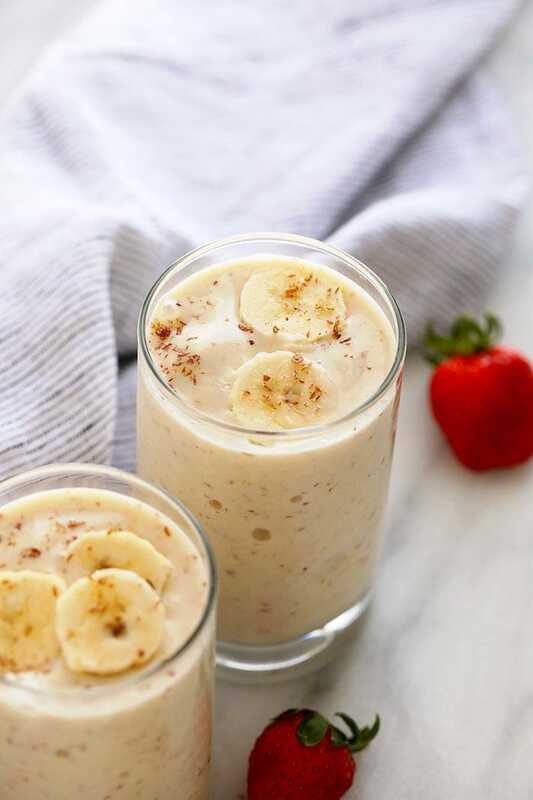 Bananas are packed with potassium, magnesium, and vitamin C. This smoothie also has extra fiber and protein from the flax and greek yogurt. If your doctor recommends a low sugar diet for you, keep in mind that bananas have a lot of natural sugar and adjust your meal prep for the week accordingly. How long can you keep a banana smoothie in the fridge? We recommend eating this banana smoothie immediately after preparing. 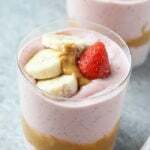 If you are prepping this banana smoothie and storing it in the refrigerator, we recommend storing your banana smoothie in the refrigerator for no longer than two days. Do you put ice in smoothies? We don’t usually recommend using ice in smoothies because it tends to water down the flavor of the smoothie. We recommend using frozen fruit over ice. However, if you are using fresh fruit, feel free to add in a handful of ice to chill the smoothie. What can replace a banana in a smoothie? Well, in this banana smoothie we recommend bananas. However, feel free to use a cup of your favorite fruit if you are out of bananas. 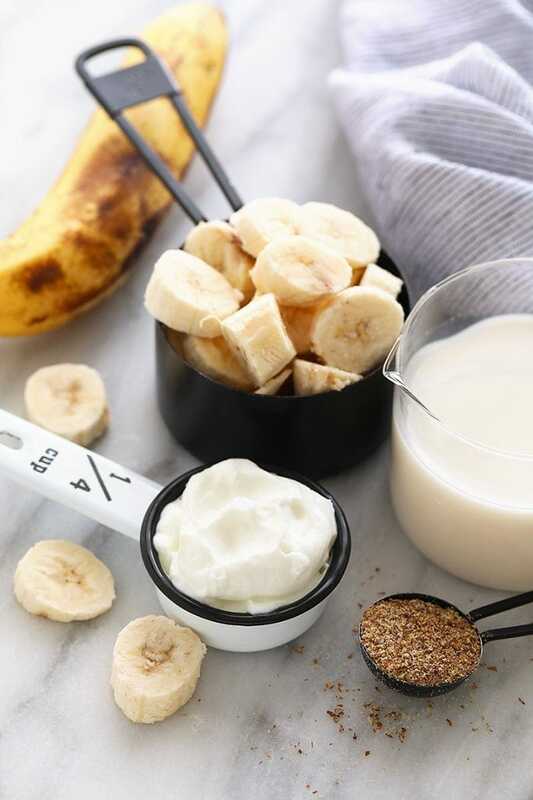 This banana smoothie is as easy as 1-2-3. Feel free to add any extra flare or ingredients if you’d like. We kept it nice and simple. If you feel like you want to add a serving of vegetables, try frozen cauliflower! If you would like a bit more texture try adding a couple of tablespoons of oatmeal. The options are endless. Measure out all of the ingredients for this banana smoothie before throwing all of the ingredients into the blender. 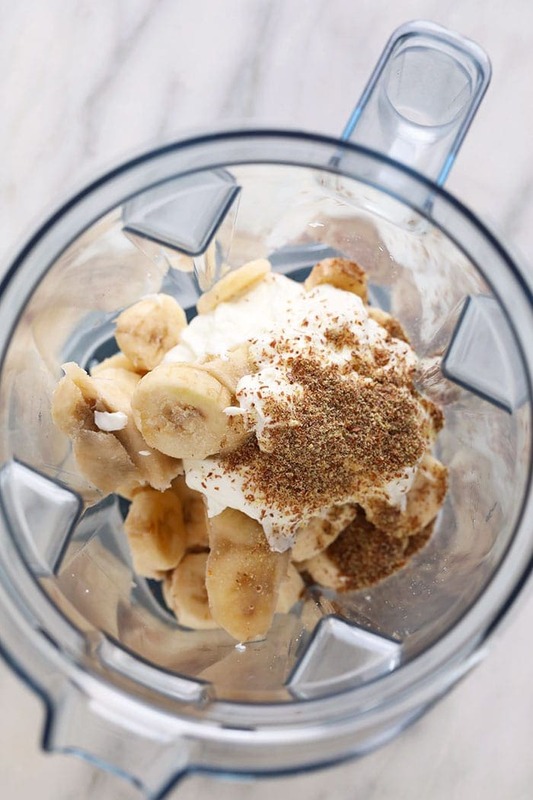 We love our Vitamix, but any blender will work to blend this healthy banana smoothie to creamy perfection! Now, remember that this banana smoothie can be as thin or as thick as you want it. If you like your smoothies a bit thinner, try adding extra almond milk. 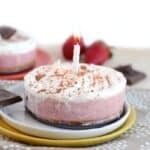 If you like thick and creamy omit some of the almond milk. Go big home when it comes to smoothie toppings! 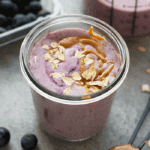 Our favorites smoothie toppings are nut butter, granola, hemp seeds, and slices of fresh fruit! 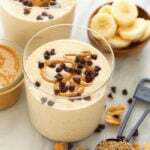 Check out some of our favorite homemade smoothie toppings for this banana smoothie below! 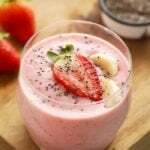 Place all ingredients in a high-speed blender and blend on high until smooth. Option to add more almond milk as needed.